Welcome to The Gaston Estate! 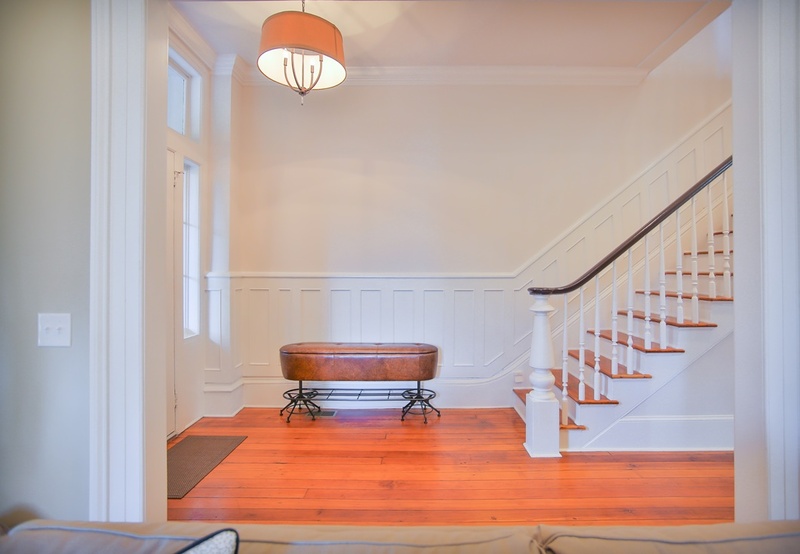 This lovely entrance hall leads you straight to the kitchen. Reunite in the uniquely modern living room. 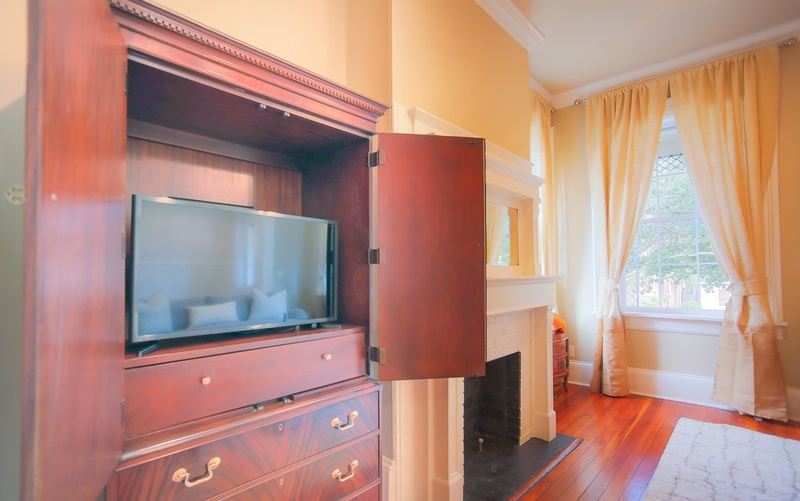 The flat screen television is located in the cherry wood armoire. Through the original pocket doors is the dining room. Fresh and eclectic dining furniture. 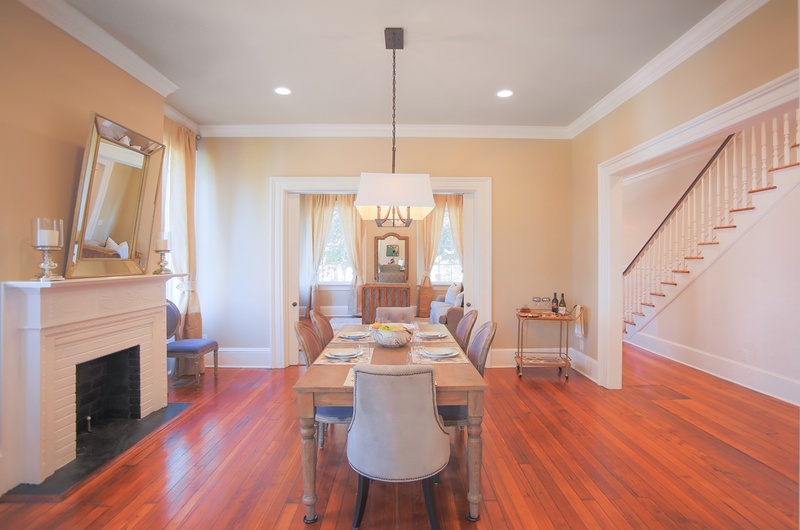 This house offers spacious living areas and high ceilings. Laugh and tell stories around the table. 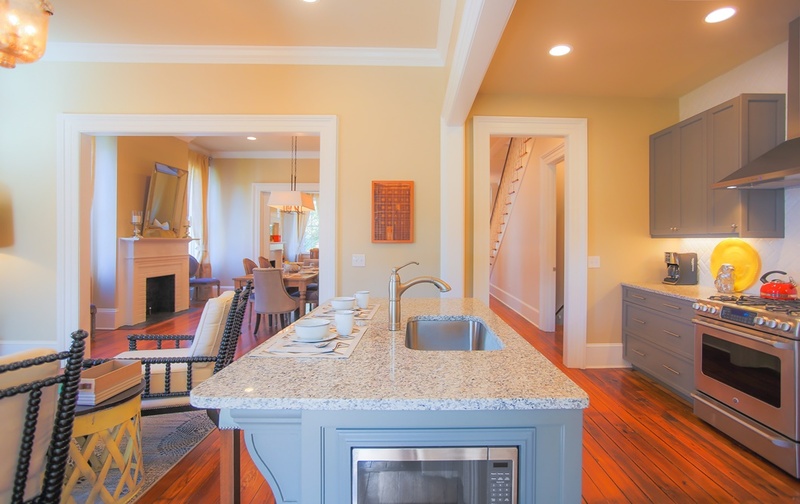 Chat with guests in the kitchen or at the breakfast bar. 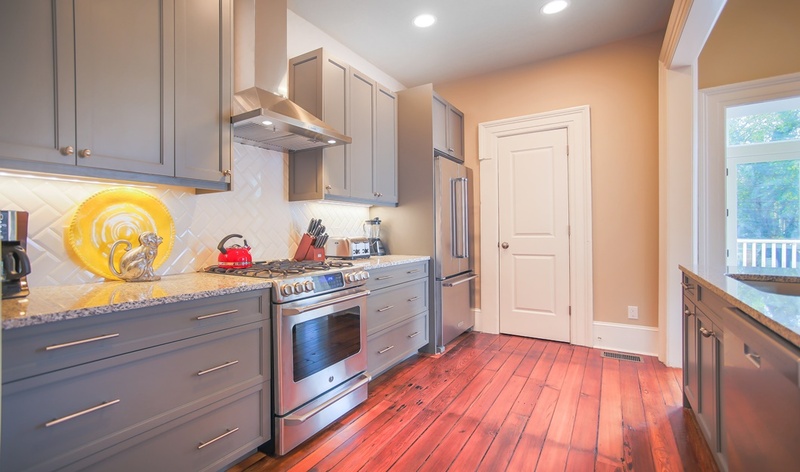 Large kitchen cabinets, stainless steel appliances and herringbone back splash is modern luxury. Watch your favorite television show while making dinner for family and friends. Sit at the breakfast bar and enjoy a morning coffee. Sunbathe in the sitting room off of the kitchen. Double doors lead out to an upper level patio. Quiet little spot to put on your shoes. Go on up the stairs to the first bedroom. Have sweet dreams in this king size bed. Get ready for a night on the town at the personal vanity. 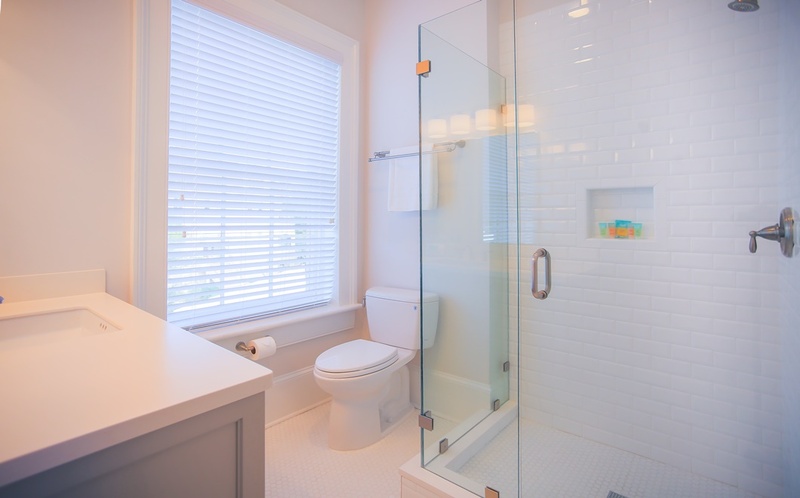 The upstairs bathroom has a glass enclosed shower and rainfall shower head. 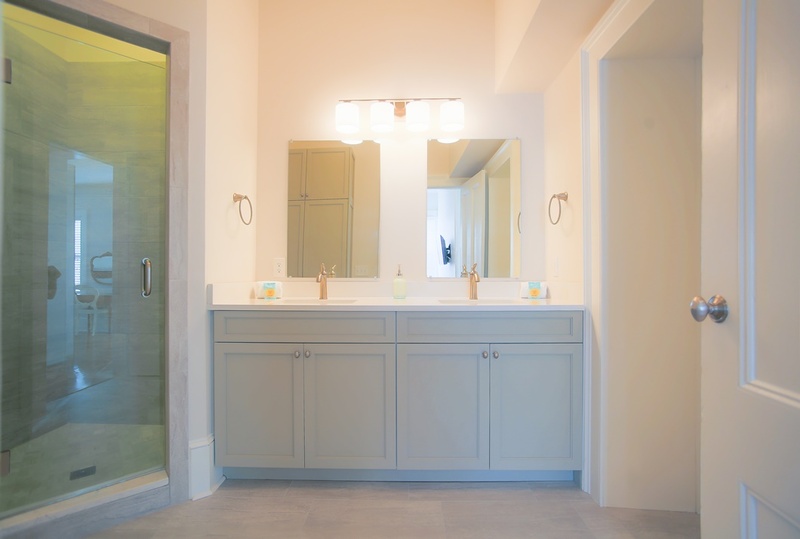 Extra space on the vanity for all your toiletry needs. 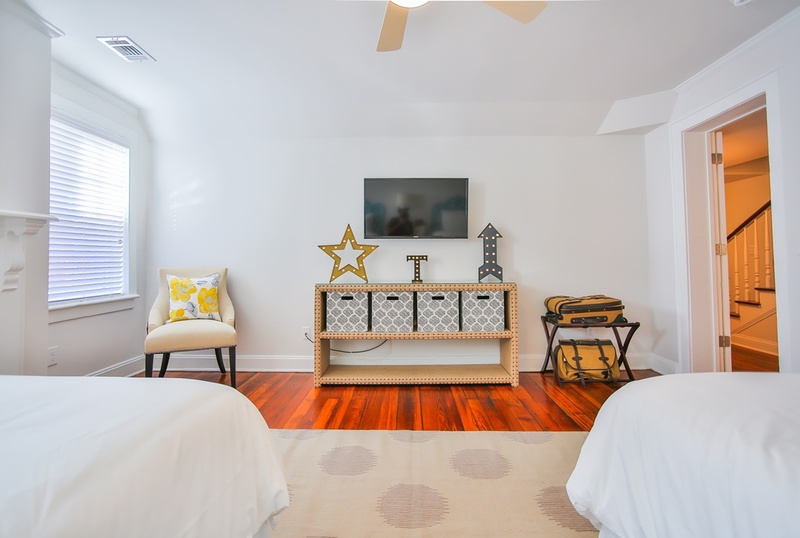 Bright pops of color bring this twin bedroom to life. Let your artistic side out on the blackboard. Great for kids! 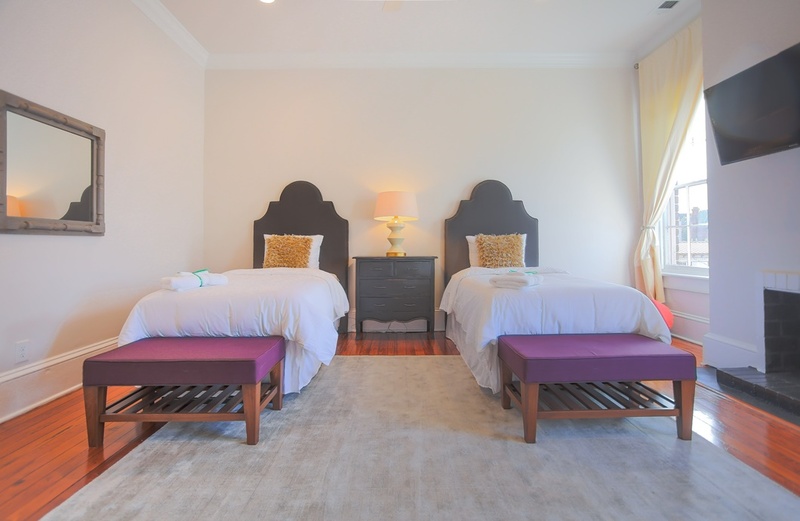 The master suite showcases a king size four poster bed. Watch a movie in the comfort of this high style bed. The en suite to the Master bedroom has a stand up shower and two vanities. 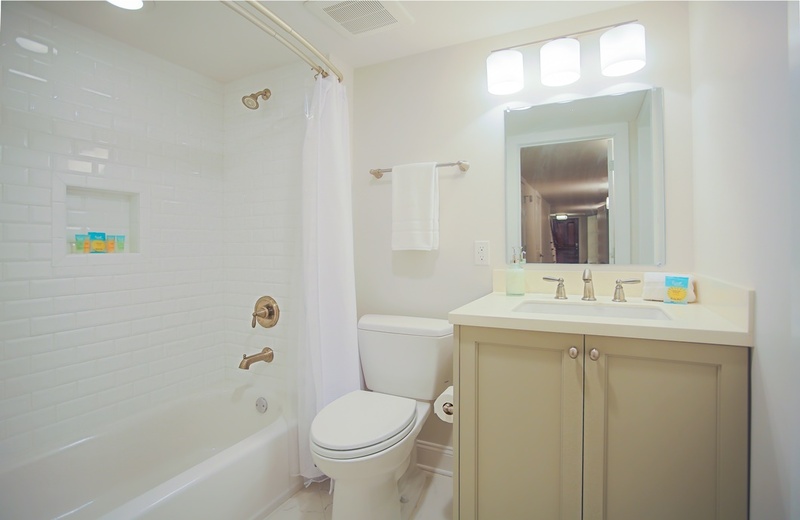 Connected to the en suite is the latrine and large soaker tub. 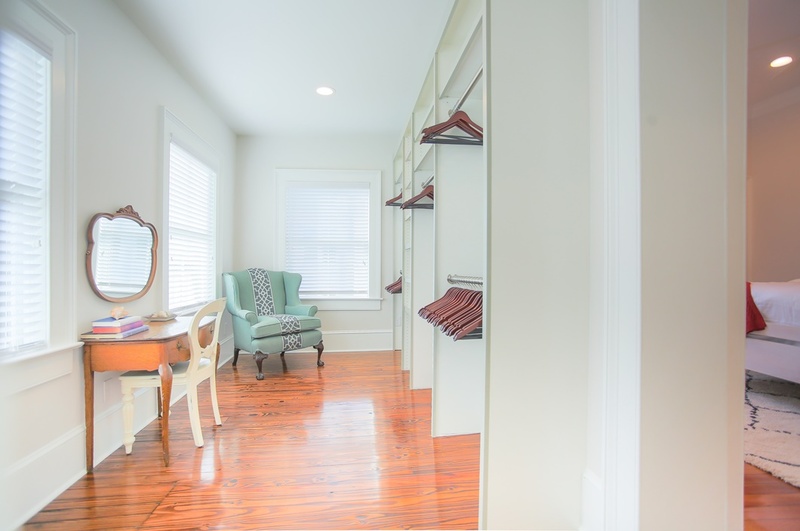 We come full circle to the expansive closet and sweet vanity area. Downstairs there is a separate entrance as to not wake up others. Unwind from all the foot travel in this king size bed. There is a large flat screen television in this room as well. 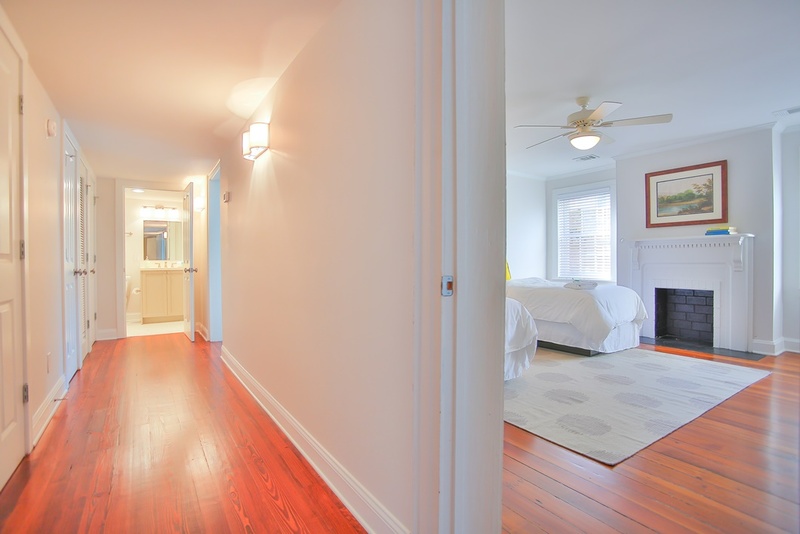 Down the hall to your right is the second twin bedroom and ahead of you is the downstairs full bathroom. The bright colors welcome and entice you. 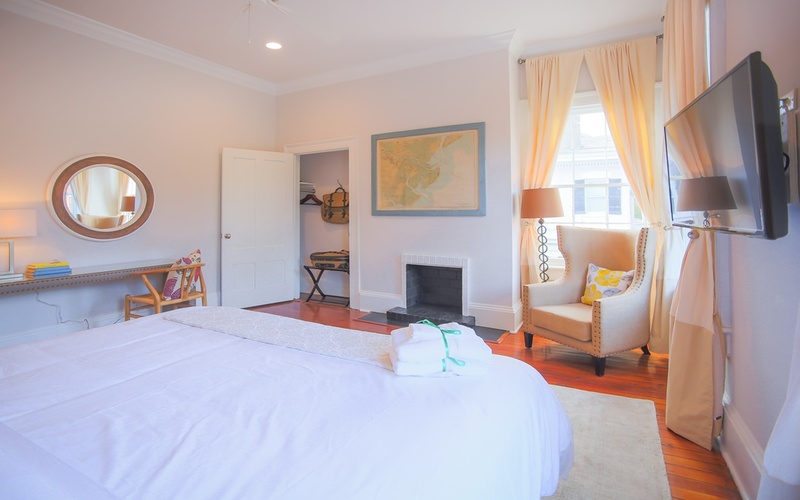 The twin bedroom is great for girls weekends, wedding parties or family. 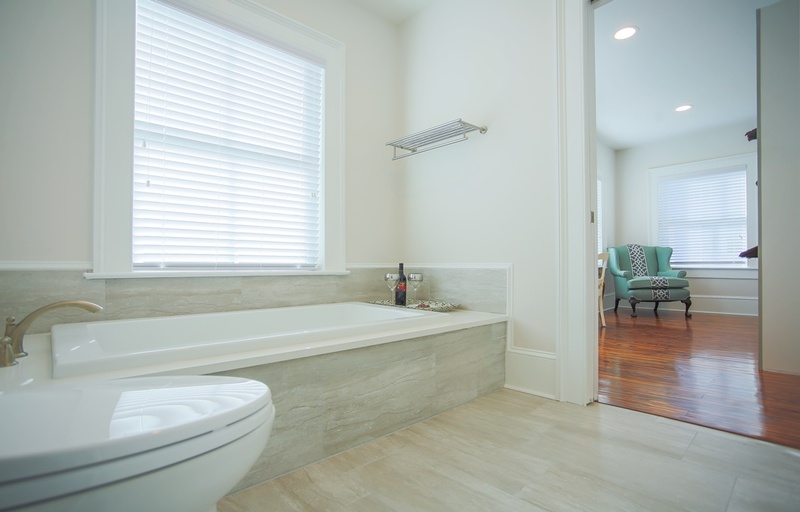 Take a soothing bath in this full tub and shower. Downstairs has it's own private entertainment space. Have this be a special room for the kids to hang out. Breakfast anyone? 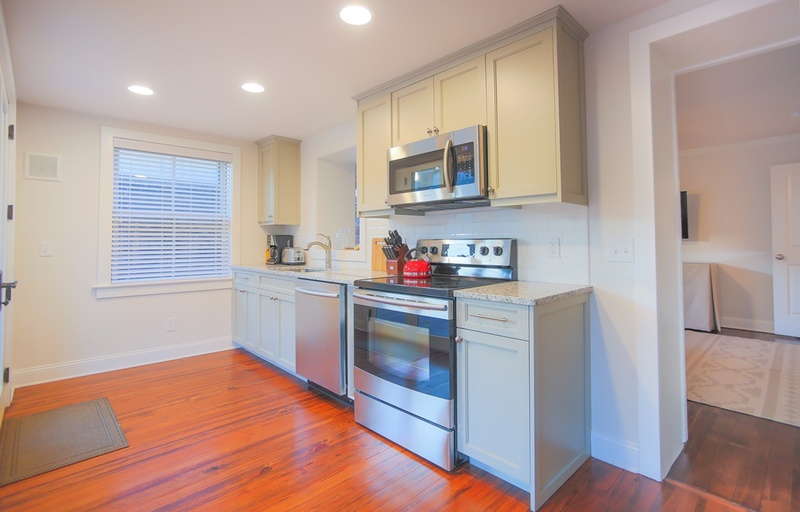 This brand new kitchen boasts modern cabinetry and new appliances. Washer and dryer are located off of the kitchen area. Parking for two cars in the back of the home as well as a courtyard beyond the fence. 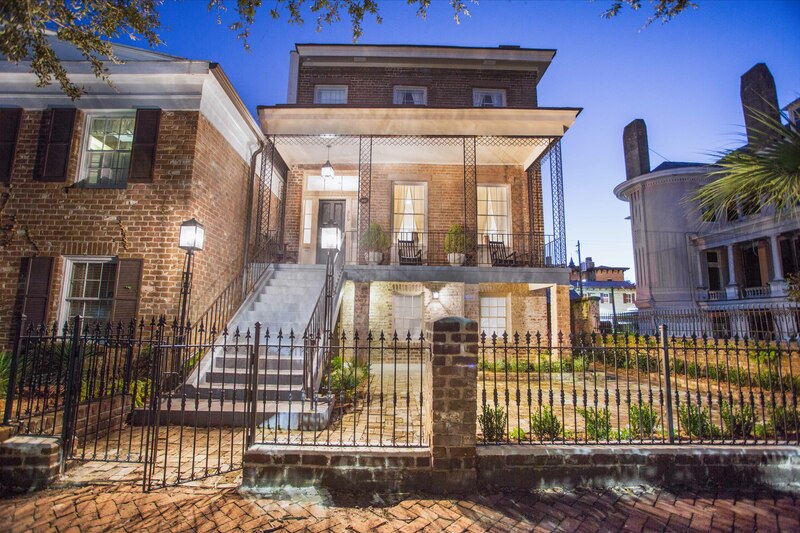 Located on beautiful, historic Gaston Street, this spectacular 5 bedroom home has been fully renovated top-to-bottom for a truly luxurious experience. 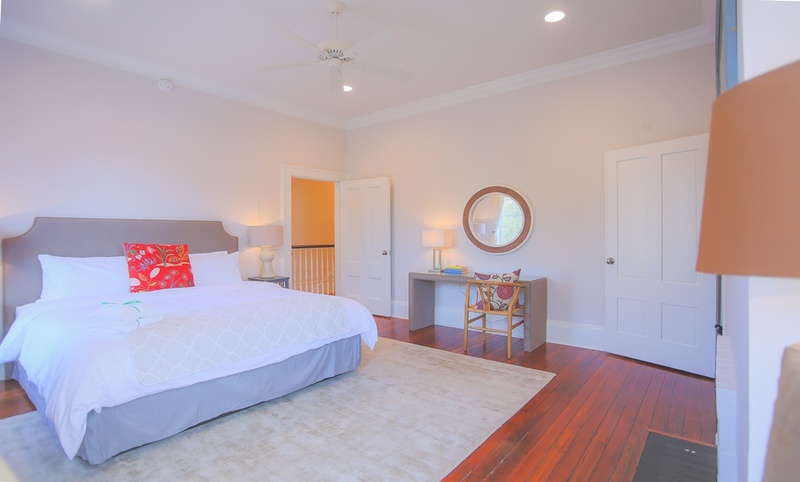 The rich hardwood flooring, crown molding, and high ceilings are complimented with sophisticated-yet-comfortable furnishings, creating an inviting space for guests to relax. 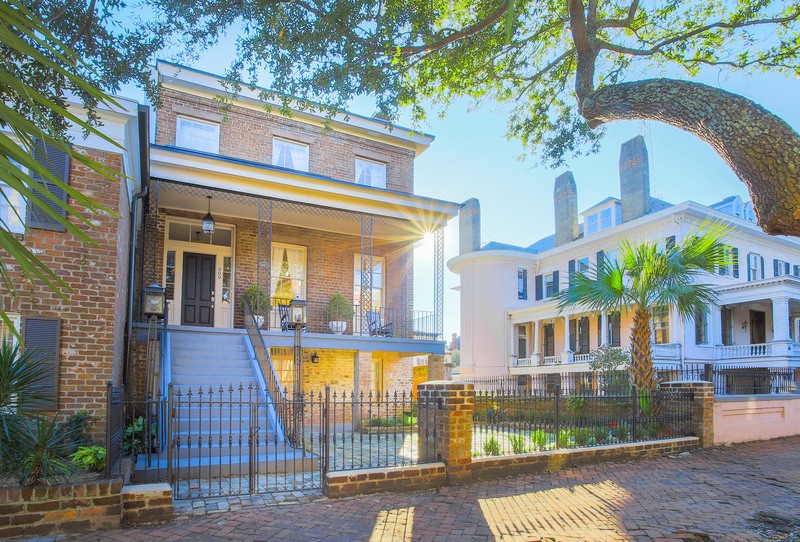 In true Savannah style, you’ll enter this home on the “second” floor to find an opening living and dining space, perfect for entertaining! 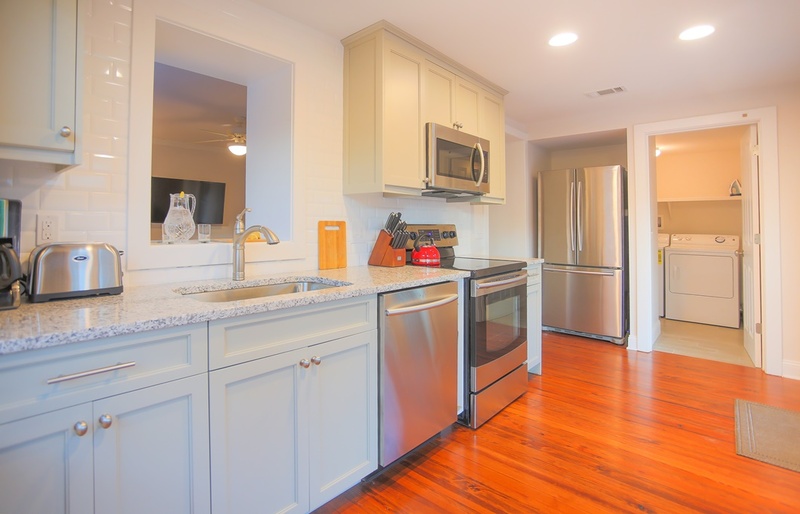 The modern kitchen has stainless steel appliances, a breakfast bar, and a conveniently located TV you can watch while cooking or enjoying your coffee. Just off of the kitchen is a sitting room with double glass doors leading to a private back porch overlooking the courtyard. 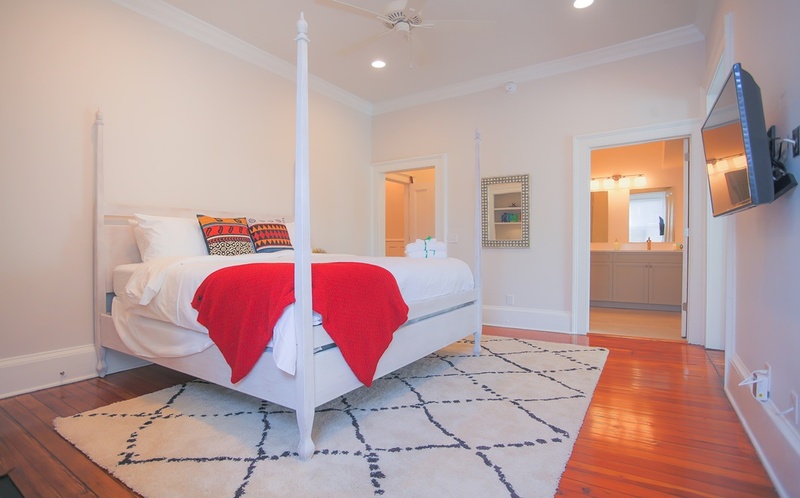 Upstairs you’ll find three roomy, bright, and stylish bedrooms. The first bedroom has a comfortable king bed and TV, perfect for relaxing after a day of sightseeing. 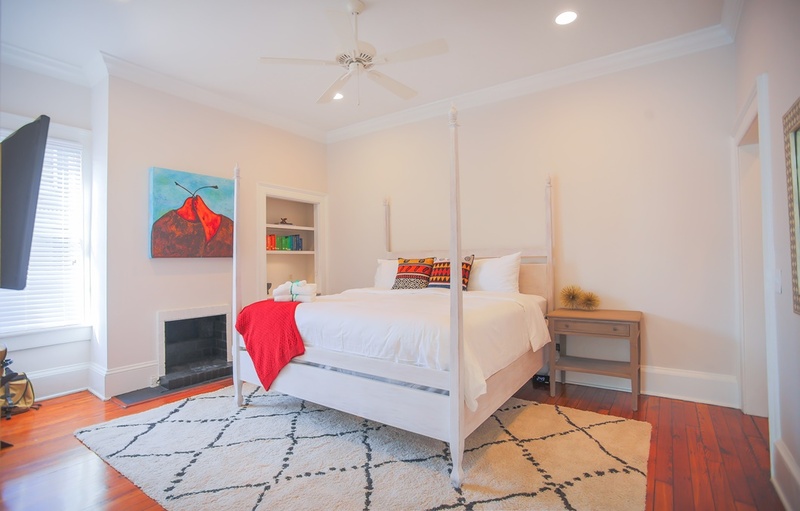 With two twin beds and a chalkboard, the second bedroom is perfect for children. 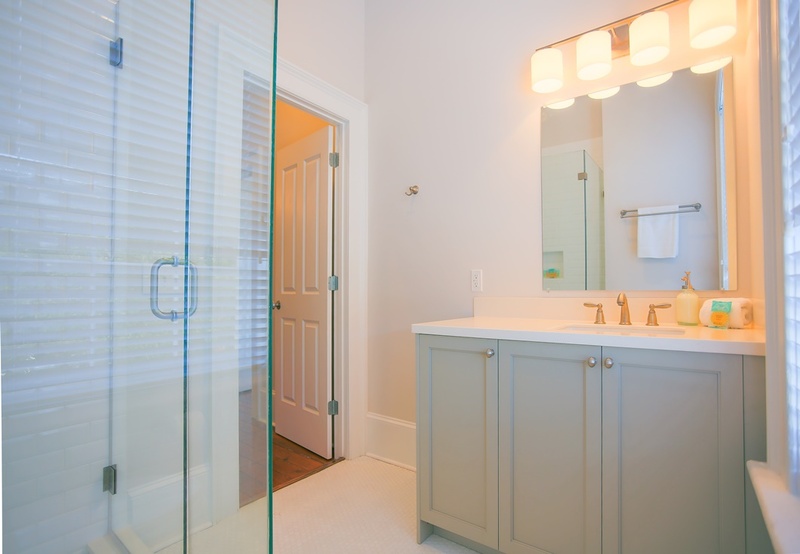 The shared bathroom has a glass enclosed shower and waterfall showerhead. 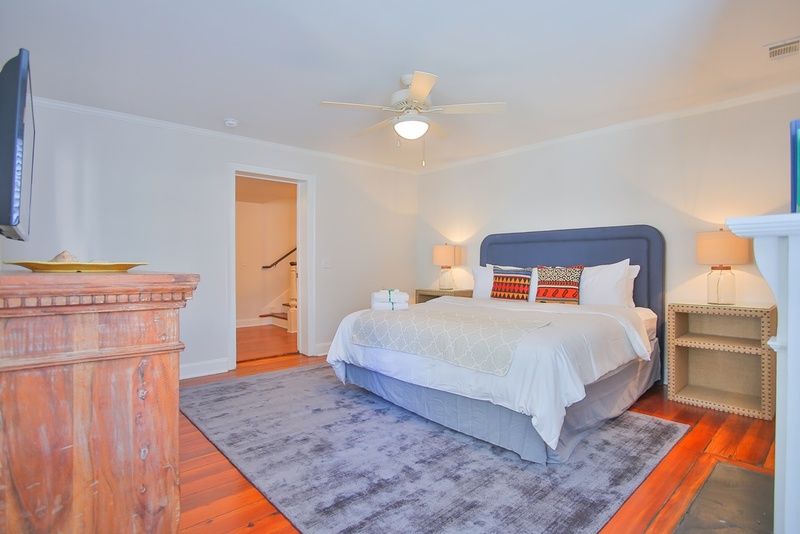 The Master Bedroom features a King sized, four poster bed, an en suite with a shower and tub, and an envy-worthy walk-in closet. 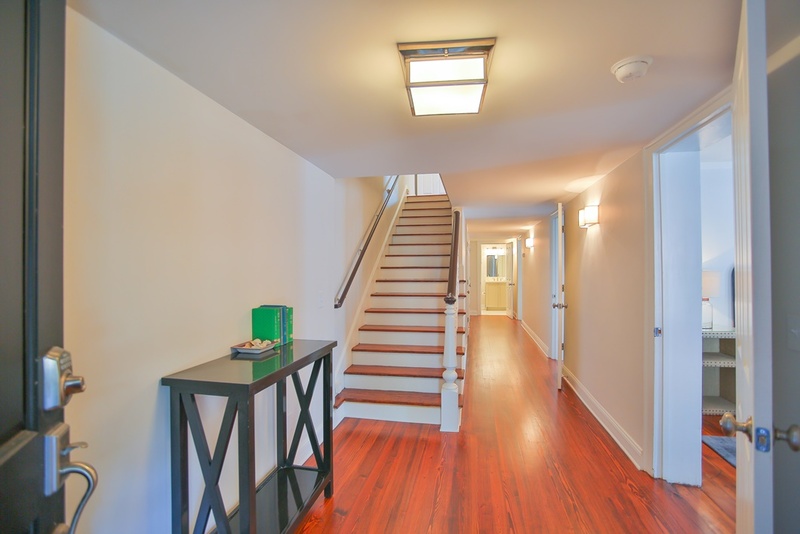 The ground floor has a separate, out door, entrance, and an interior staircase and entrance to the main floor. 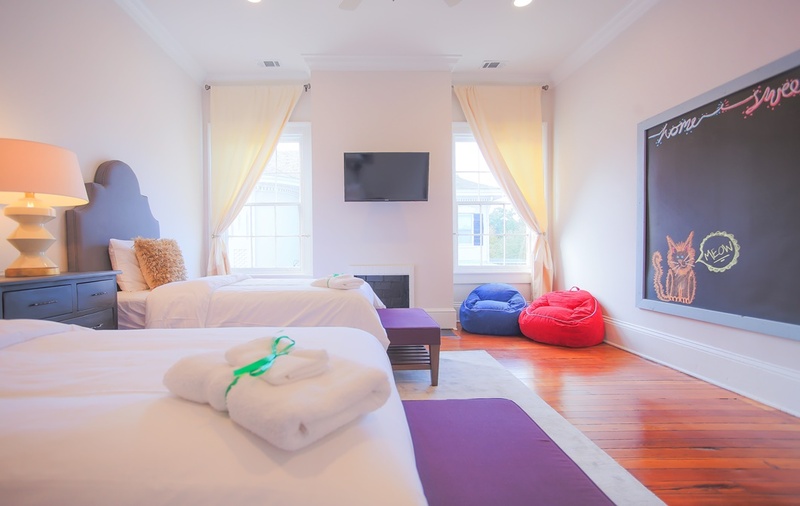 There are two spacious bedrooms, one with a king bed and one with two twin beds, and a private living space. 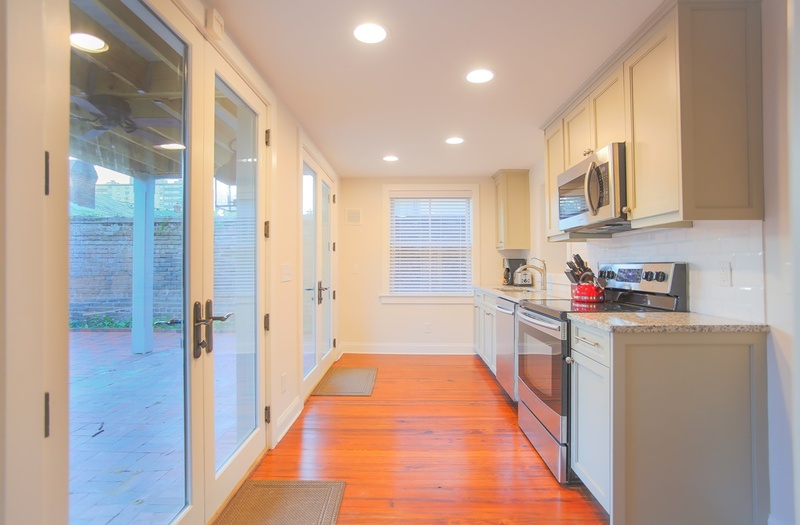 There is also a laundry room off of the kitchen, which has double glass doors leading to the courtyard. 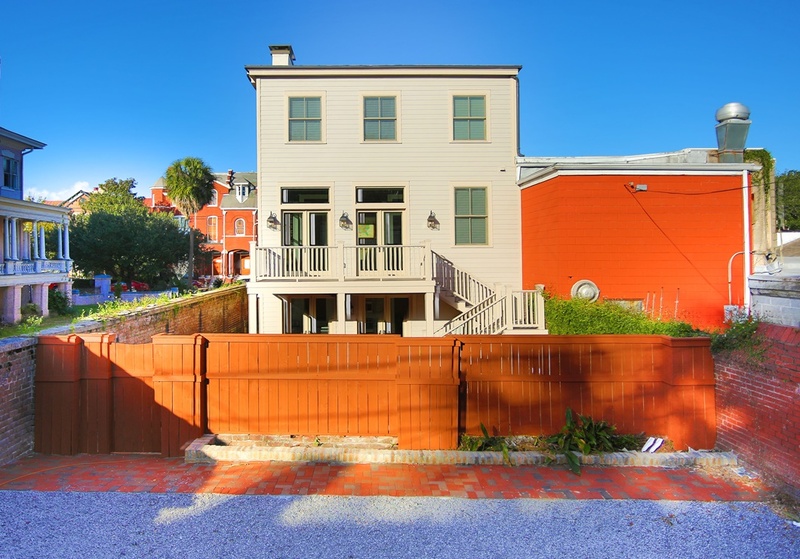 This home is located only three blocks from the city's largest green space, Forsyth Park. Take a stroll down the tree-lined streets to start your day at Clary’s Cafe, the setting for several breakfast scenes in Midnight in the Garden of Good and Evil. 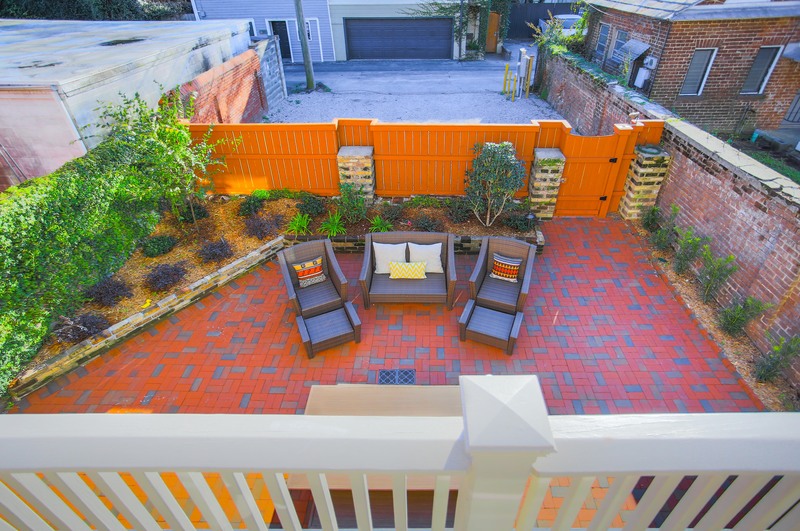 1) The large, private courtyard has a grill, so you can enjoy the Savannah evening with your family and friends. 2) There are two parking spots located behind The Gaston Estate. 3) The twin bedrooms are perfect for families with children. 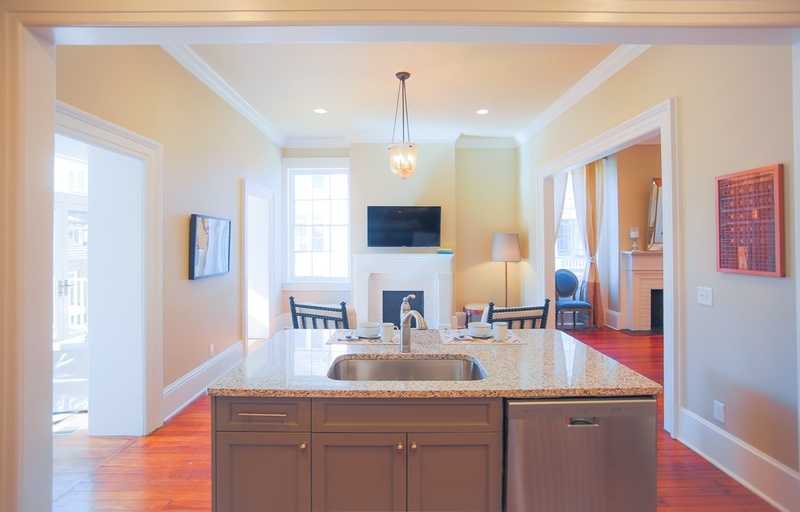 4) This home has ample space, making it fantastic for family and/or college reunions, wedding parties, and much more! Three generations of our family met for a long reunion weekend; grandparents, two sets of parents and their very young children gathered from across the country. Thank you so much for making everything so easy. The room sizes were wonderful. We loved that we could easily fit 8 people in the dining room. We would def. stay again. The house was beautiful, big and clean. It was perfect for a girl's weekend with 10 women. 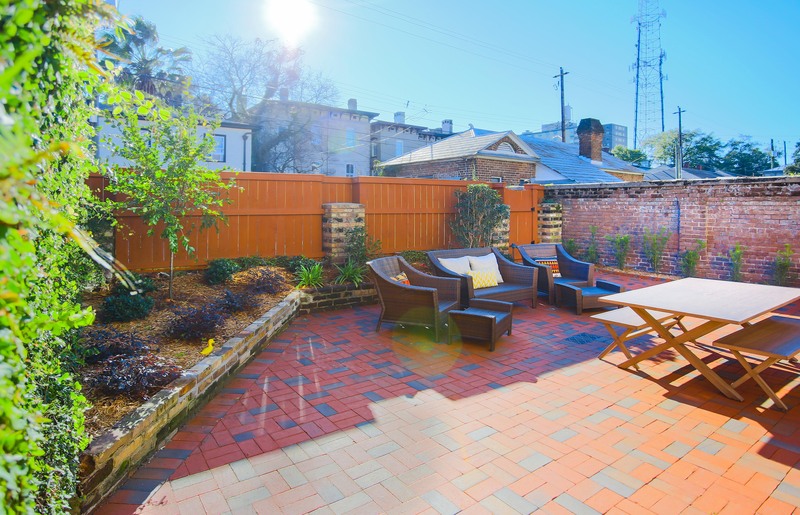 Close to Forsyth park and not far from the river, if you want to walk. There's a liquor store around the corner, that was very convenient. We cooked quite a bit and used the outdoor grill. We would've liked a few more trash bags and kitchen towels. Also, every rental we've had, has always had some basic olive oil, S/P, etc. but not this house. Not a big deal but had to buy it. 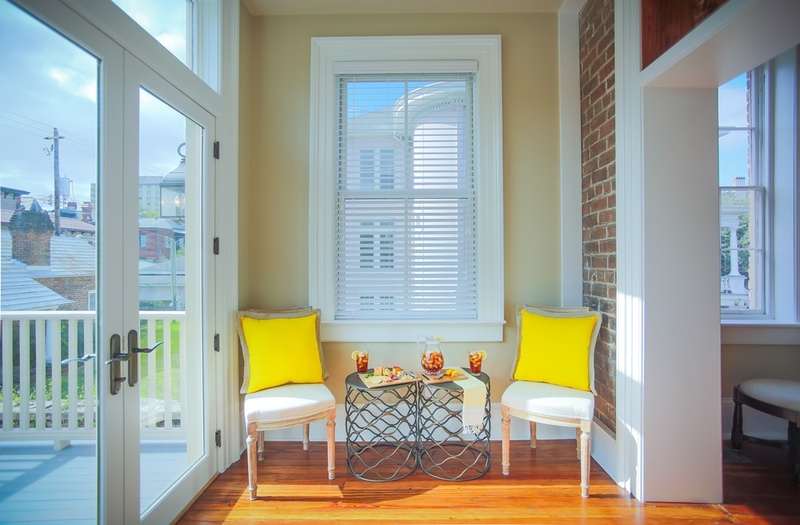 I've already recommeded the house to a friend who is planning a weekend in Savannah. Would rent here again in a heartbeat! Fun girls’ weekend in Savannah! Myself and 8 girlfriends went to Savannah to have a girls weekend and just eat and shop and relax. The House was perfect. The man agent company kept in close contact with any pertinent updates coming as soon as needed and frequent check ins. 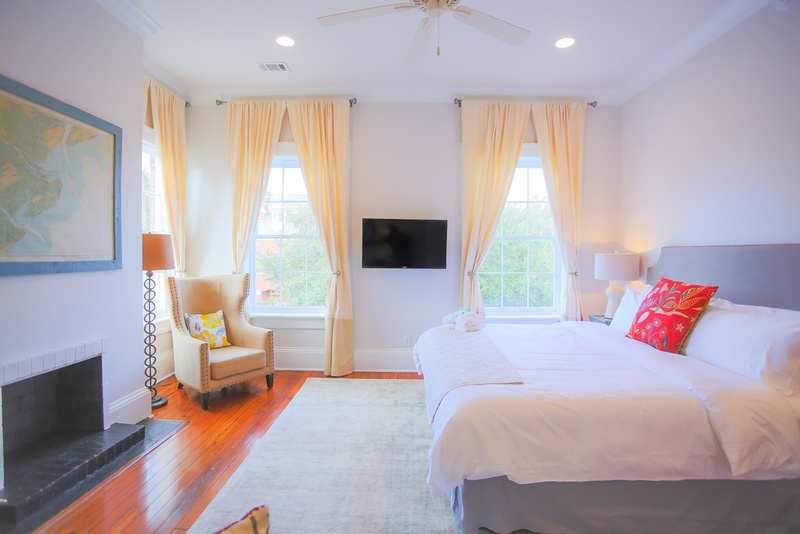 We had everything we needed in the house - it was fully stocked and more and it was lovely and comfortable throughout! We had a great time! Five friends and I stayed at the Estate on Gaston for a weekend. 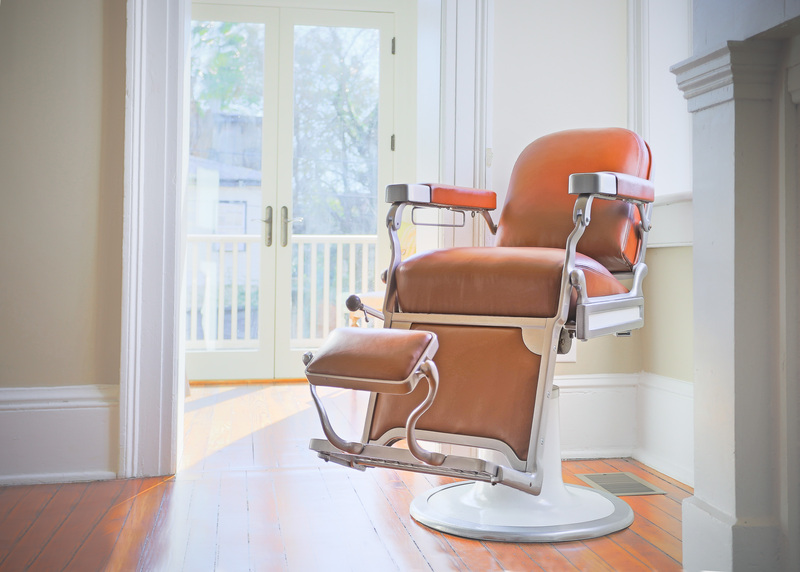 The house is beautiful, well maintained, and clean. 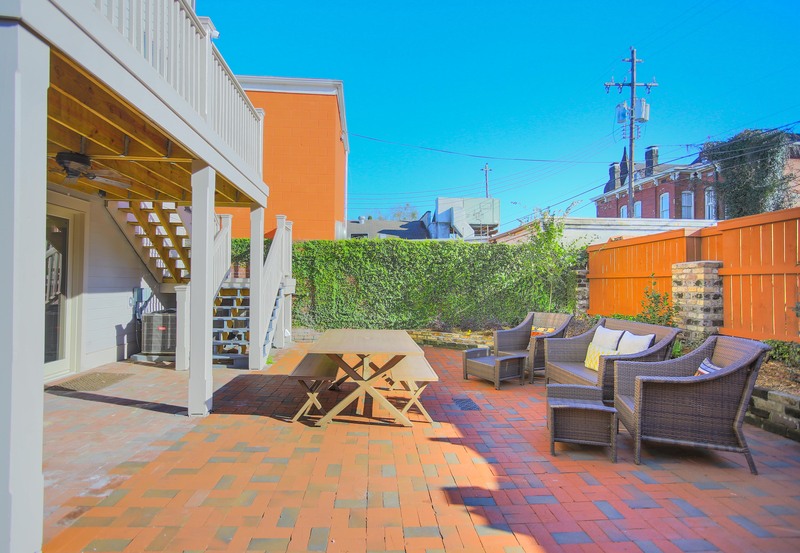 It is close enough to walk to all the attractions but far enough away from River Street to enjoy the quiet neighborhood. I did try to call the day before our check-in date, and again the morning of, to request an early check-in, but no one from Lucky Savannah returned my calls. So there ended up being some confusion about when we could enter the property. Other than that our stay was fantastic. I hope to be able to return to Savannah for another visit and I would definitely want to stay here again. Hi Jill! Thanks again for choosing Lucky Savannah. It sounds like you and your friends had a fabulous time at The Gaston Estate. We look forward to hosting you again soon! The house was in excellent shape. It would have been nice to have had cushions on the exterior seating. Otherwise, the house was excellent. We had a fabulous time.We fell in ❤️❤️❤️❤️❤️ with this home. The house was perfect for our girls weekend. Very comfortable, lots of character and had everything we needed. Also an easy walk to almost everywhere in the city. Our family rented The Gaston Estate for a family get-together in Savannah. 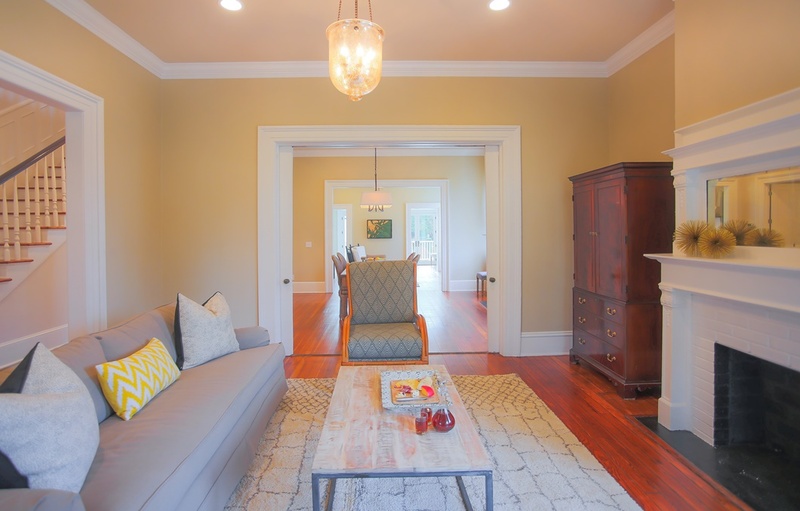 The house is charming, spacious, well appointed, and was a perfect size for our group. The bedrooms and bathrooms were clean and the kitchen was attractive and had everything we needed. 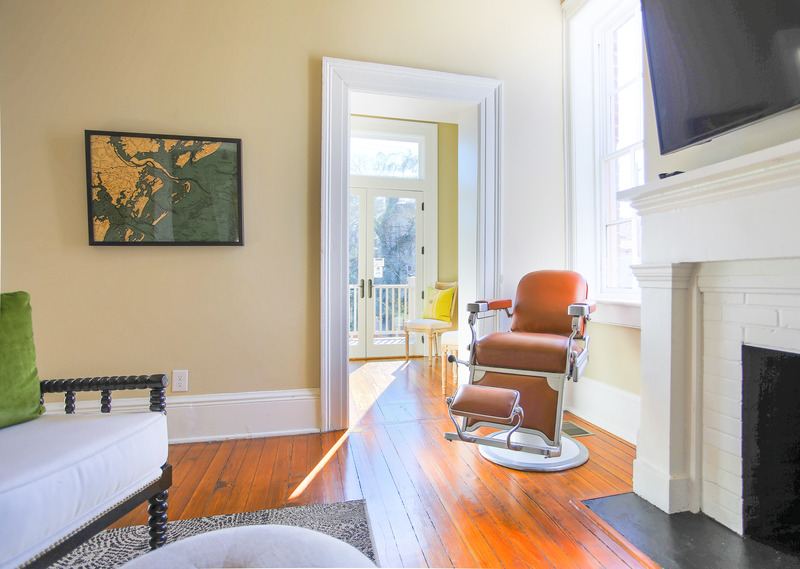 The house is within walking distance to many attractions and popular areas within Savannah. Highly recommended! A great place for a family. I rented property for 2 days, Friday 8/10/18-Sunday 8/12/18 for 7 of us for a girlfriends getaway. 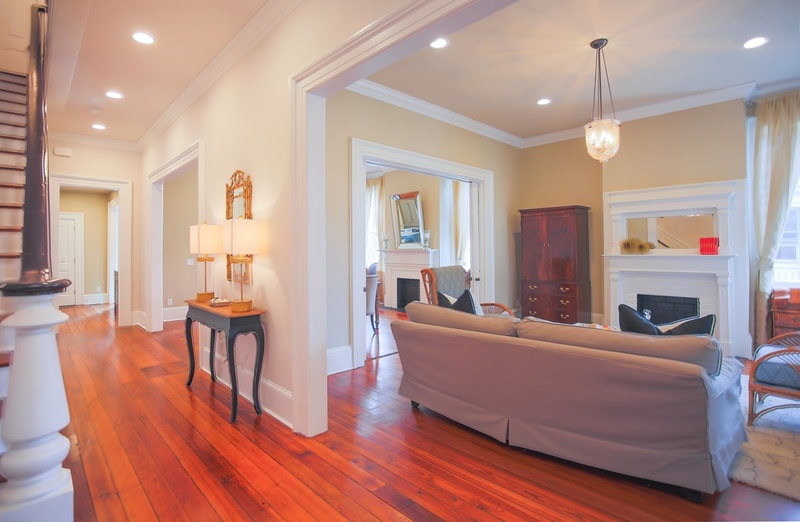 House was very clean, looks better than pictured and very spacious. Everyone reported that their bed was comfortable. Property management, at my request, had a beautiful bouquet of flowers waiting for us upon friends were pleasantly surprised. Since our flight arrived early, we appreciated the offer to leave our luggage and bulky Boston outerwear at the rental office so we could get right to a day of exploring. We were an odd mix of guests, extended family that ranged from 20-somethings to 60-somethings. The rental property suited us all very well. 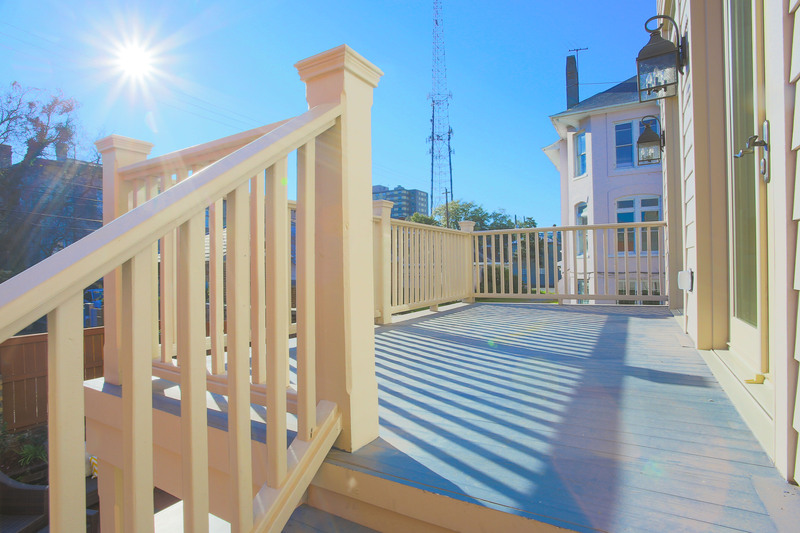 The property was clean and well maintained, the location was convenient to our daily adventures around town. Using a lock code for the door is so much smarter than a key system that can create all sorts of challenges. We appreciated the parking spot, as one of our guests did have a car. The only disappointment was that (and perhaps this was a misunderstanding on my part) we expected a hot tub on the premises and there was none. No great loss as we kept our days full and busy. 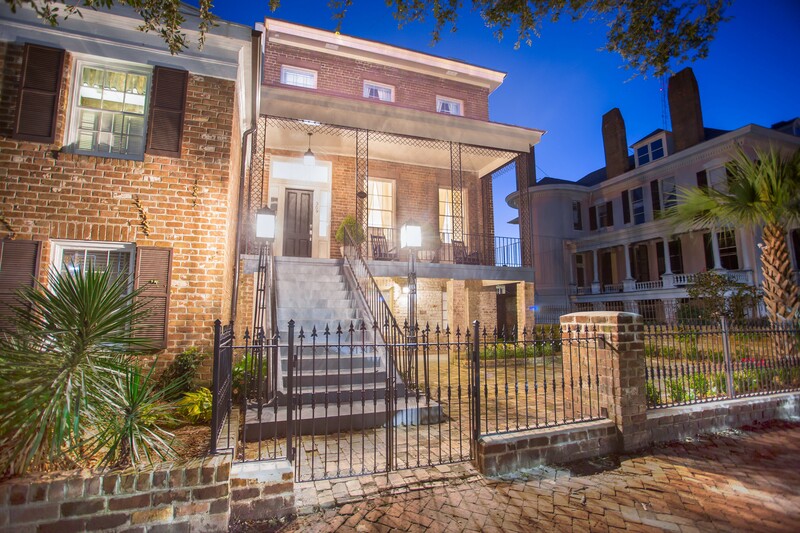 We enjoyed a great introduction to Savannah and it was a great property. Thank you for choosing to stay with Lucky Savannah! We are so glad to hear we were able to help with your luggage. If your flight arrives early, we are more than happy to hold your luggage at our office, until your home is ready! The Gaston Estate is a stunning home, and we are ecstatic you all enjoyed your stay! We definitely hope to have you all again soon. This home was the PERFECT venue for my daughter's wedding weekend. We had more than enough room for family and bridesmaids. 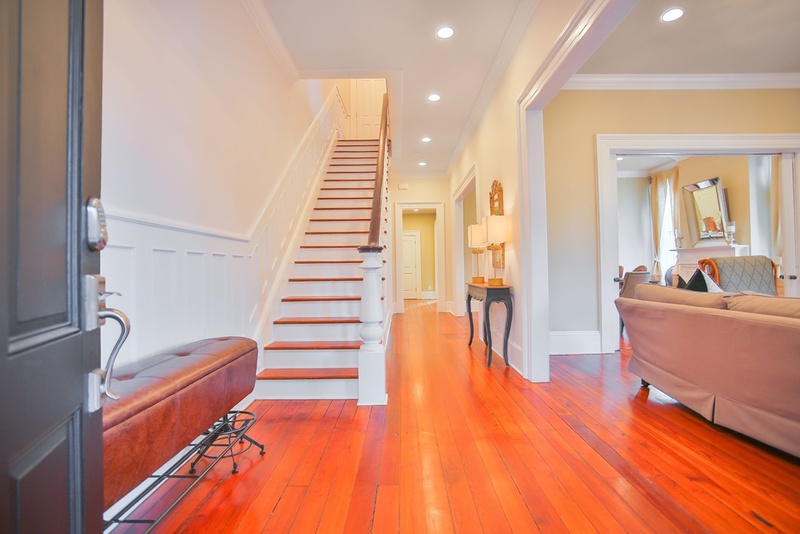 The home was spotless from top to bottom and is absolutely gorgeous! I only wish there had been ferns on the front porch as shown in picture...but that was not a super big deal. Thank you for choosing to stay with Lucky Savannah! We are ecstatic to hear you found the home to be perfect. 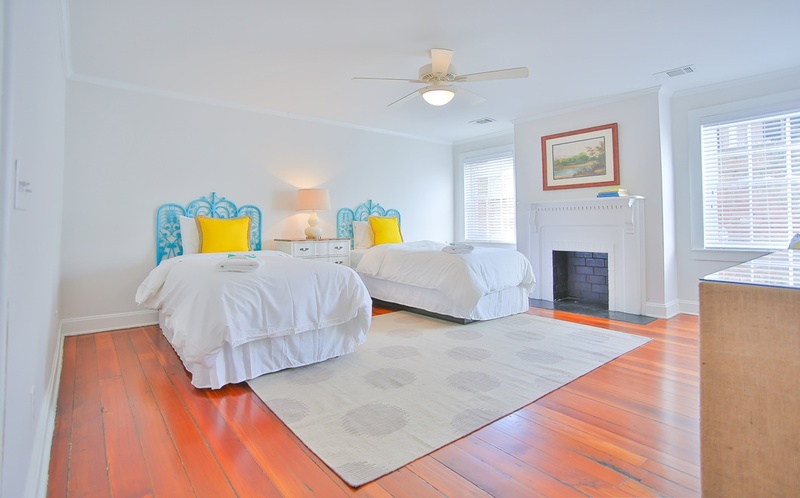 The Gaston Estate has been recently renovated top to bottom, and has been tastefully finished! We are happy your family had plenty of room to spread out.. This home offers plenty of privacy as well. We are currently working with our courtyard team to plant beautiful flowers to replace the ferns you may have seen online! We hope to have you all again soon. The place was beautiful. Lots of room, very clean,great location. Slept 9 people very comfortably. We stayed in the bottom apartment, private and roomy . We loved the private kitchen and TV room. Could not beat this place for a large family. Great family vacation! Home was perfect for a large group. Would definitely rent this home again. My husband and I decided to have a family vacation with our kids and grandkids instead of 60th birthday parties for both of us. This home was amazing as each family all had our private bedrooms and bathrooms. The amenities in the kitchen were high class and abundant. Check in and out were a piece of cake as well. It's a wonderful home for a family get together as it's such a great walking city. Hi Rene! Thank you so much again for choosing to stay with us. We're so glad to hear you enjoyed your 60th birthday weekend in our Gaston Estate property. Please know that you're privy to our Friends and Family discount next time you stay with us. Looking forward to hosting you again soon! We had reunion of 1975 graduates. Very happy with stay. Little issue with water leaks and was taken care of and also compensated by owner without us asking. Everything is walking distance, I would say mile and half radius. Only issue is smart Thermostat is keep going back to 80 in living room. We stayed in The Gaston Estate for a girls trip. It was in a great location. About a 10 minute walk to the river front. The house was very clean and the main floor was perfect for gathering and down time. We would definitely stay here again! Thank you for staying at The Gaston Estate, Theresa! 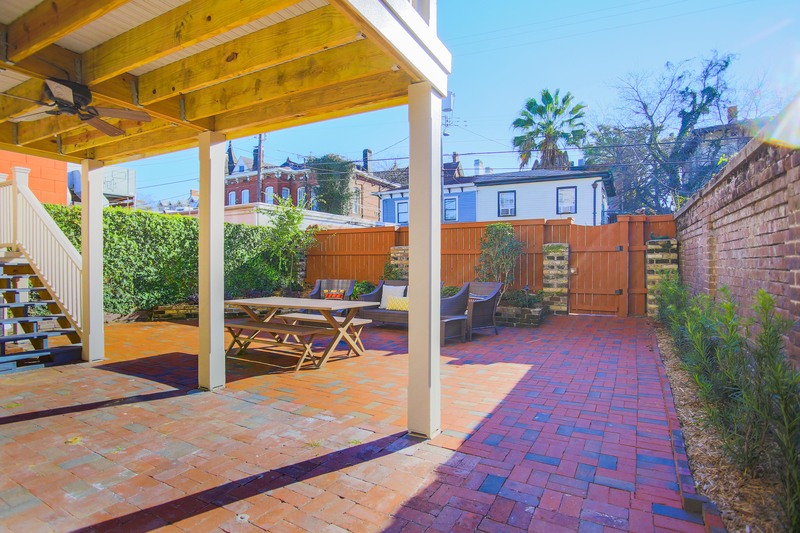 Excellent property well decorated with plenty of space. We enjoyed wandering around the area seeing the beautiful houses and squares. The local walking tour was excellent. Hi Christopher! Thank you so much again for choosing to stay with us. 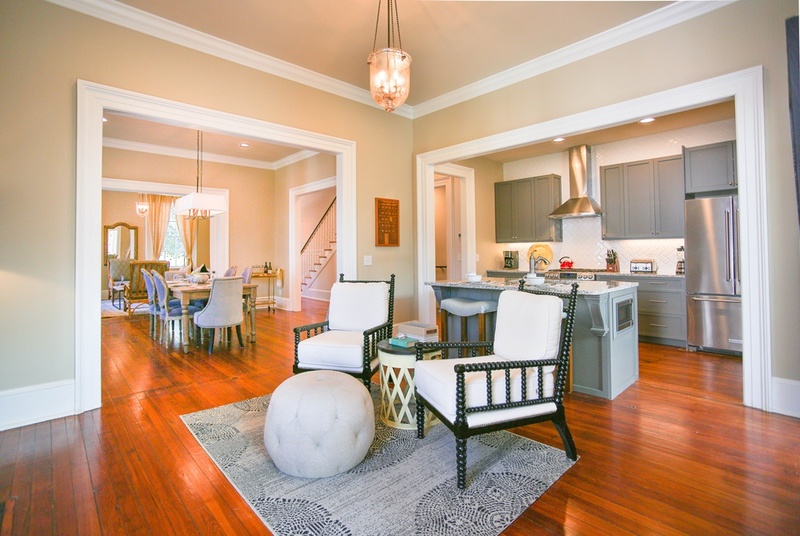 We're so glad to hear you enjoyed the location and spaciousness of The Gaston Estate. Please know you're privy to our Friends and Family discount next time you stay with us, and we look forward to hosting you again soon. 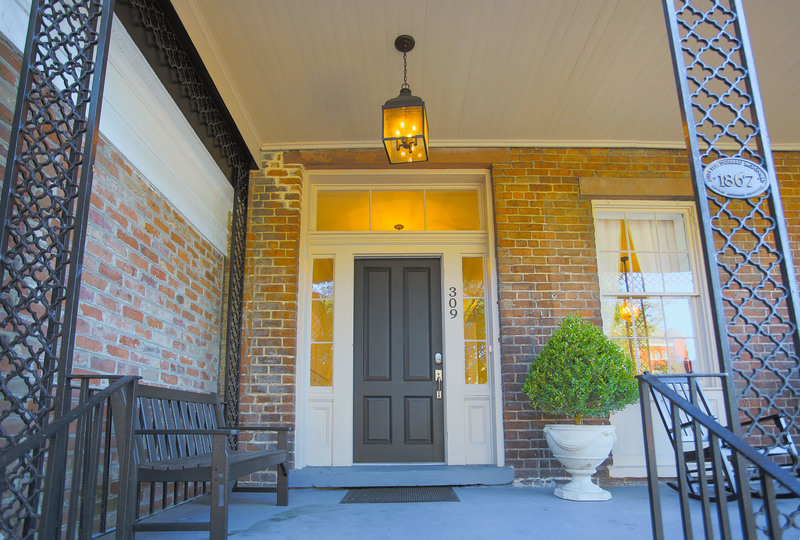 Located on a quiet street only a few blocks off Forsyth Park. House and furnishings are very comfortable. Would rent again. Thanks again for staying with us, Wes! We had 11 family members meet in Savannah for our mother's 77 birthday. Lucky Savannah provided excellent customer service when our original rental developed a leak in the roof after our first night there. We were switched to this beautiful home on Gaston for the remainder of our vacation. 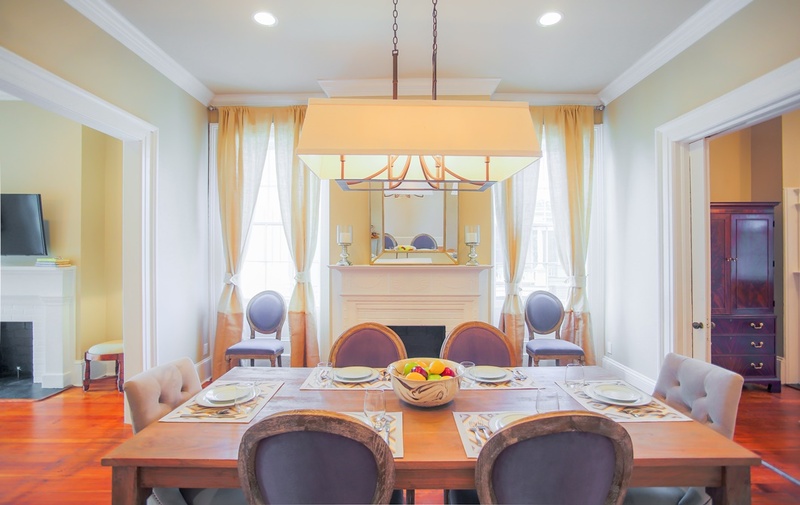 This house is perfect for large families, with ample room for cooking and gathering together. Two spaces for cars to park in back and easy walking distance to Forsyth Park. I have nothing but good things to say about the rental and Lucky Savannah. 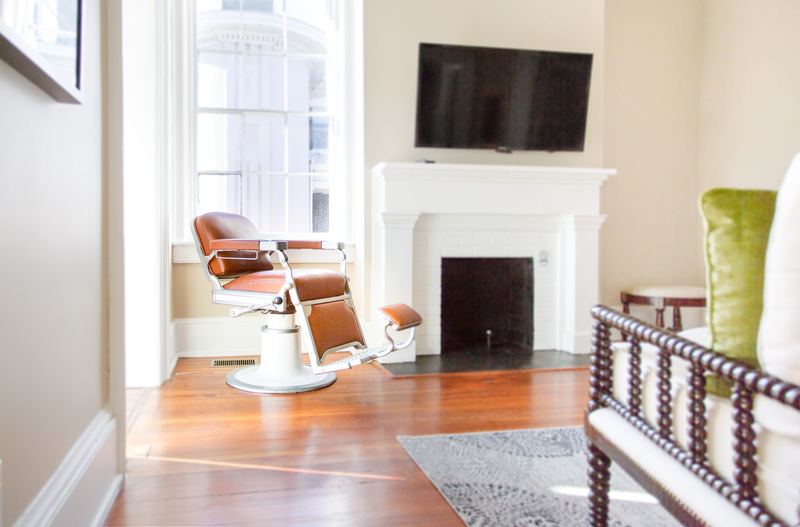 Lucky Savannah and their staff want to give the customer the best experience possible while in Savannah, and it showed. I would definitely rent from them again. Hi Tammy! Thank you again for being such a pleasure to work with. We're so happy to hear that our customer service elevated your Savannah stay. We look forward to hosting you again soon. Staying at The Gaston Estate was an incredible experience for myself and our team. 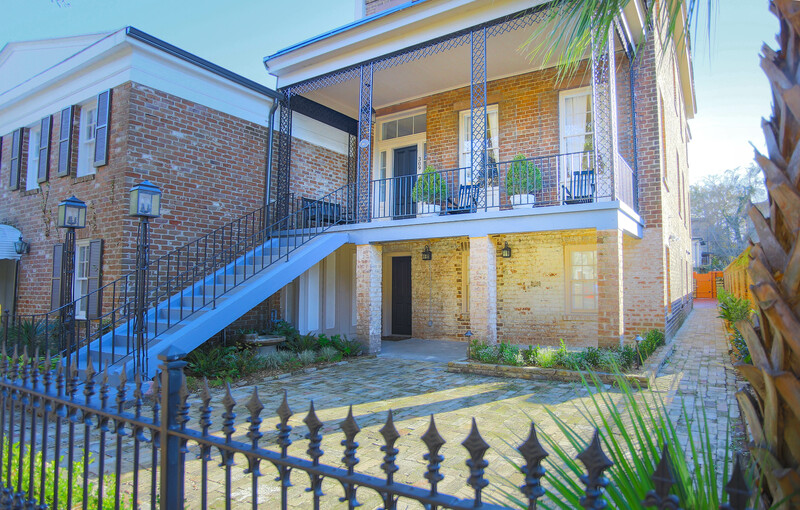 Ensconced in the heart of the historic district we were able to make full use of this beautiful home and its amenities. I would recommend this location to anyone. Thank you for staying at The Gaston Estate, Gina! We're so happy to hear that you were able to make full use of this beautiful home. Thank you for the recommendation! We rented the house for my son's wedding. It is beautiful and spacious. The rental company is very ready to work with. Only one complaint but it's a small one, not enough kitchen extras such as dish towels and garbage bags but that's a small thing - the pots and pans and fish ware are more than sufficient. I would recommend this house and company highly. Thank you for staying with us, Marie! If during your next stay you find yourself short of a supply, please notify our Guest Services and we'd be happy to accommodate you. We look forward to hosting you again soon! Loved the house loved the location. Lots of room for 9 people. Had trouble programming the thermostats. We tried to turn them down at night but they kept coming on. Made it very hot at night. Walked in to several fragrance plug ins that were so over powering we had to open windows and unplug them when we arrived. We also wished that sheets were not so stiff and scratchy. Just some things we found not pleasant from this beautiful house. Claudia, thank you for choosing The Gaston Estate! We're so appreciative of your feedback and hope to host you again soon. We were a girl's group of lifelong friends. The home was in immaculate condition, awesome location, and had the best stocked kitchen of any other rental property I have stayed in. The location was perfect for us - lots of walking and close to just about everything. There was one issue with a broken sidelight by the front door. It could have easily admitted someone up to no good just by reaching in and unlocking the door. Someone had taped cardboard over it, but that was no measure of security. Since it was there when we arrived we assumed it might have just happened and most likely would not be fixed right away. Since it was a historical home, we also assumed the glass had to be custom ordered? The folks at Lucky Savannah were super polite and accommodating. Becky, thank you again for choosing Lucky Savannah! We're so happy to hear that you enjoyed the condition and location of Gaston Estate. The sidelight was scheduled for repair just after your departure, as to not interrupt your stay. We do hope to host you again soon! I took the entire family including two grandchildren to Estate on Gaston for Xmas. The house was very accommodating and we had a lovely stay. All of our wants and needs were within walking distance. I would highly recommend this location. Thank you for choosing Lucky Savannah to host your entire family, Richard! We hope to host you again next year. Thank you for choosing to stay with Lucky Savannah! We are so thrilled to hear you all enjoyed The Gaston Estate. 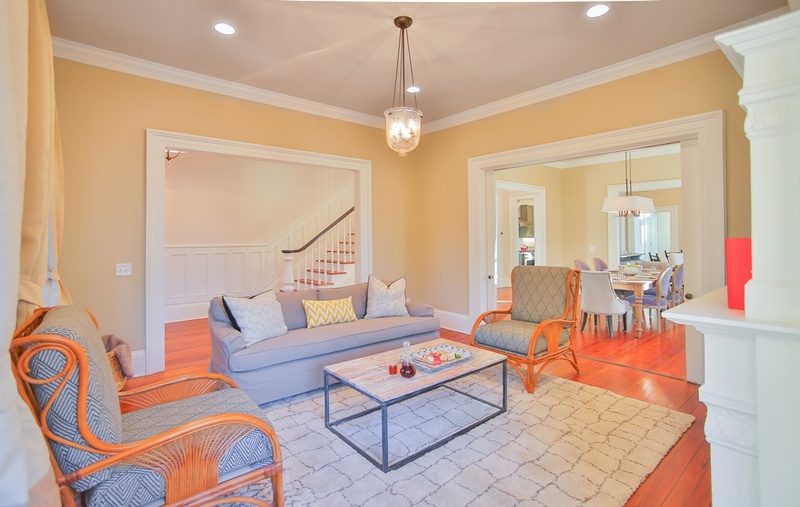 This home is a gorgeous, newly renovated Estate and we are so glad you all were some of our first guests. We sure hope to have you all as our guests again in the near future. Please don't forget about our 10% "Returning Guest" discount! 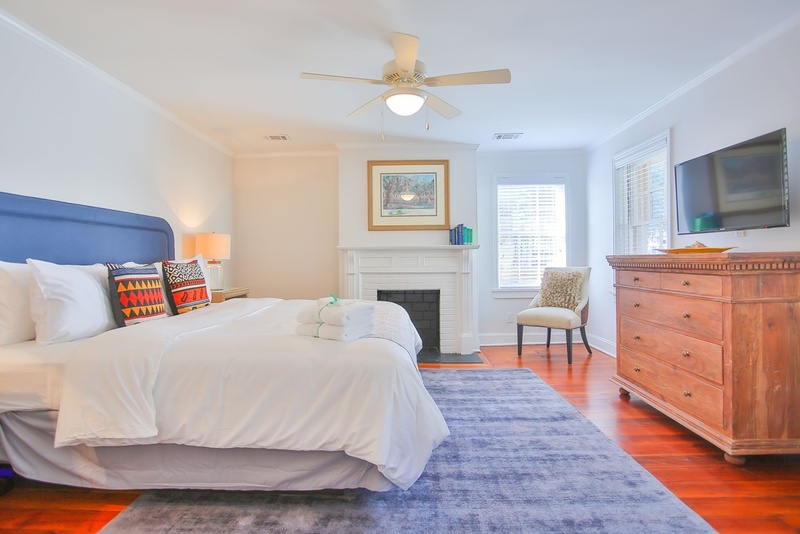 Beautifully renovated home in the heart of the Historic District! 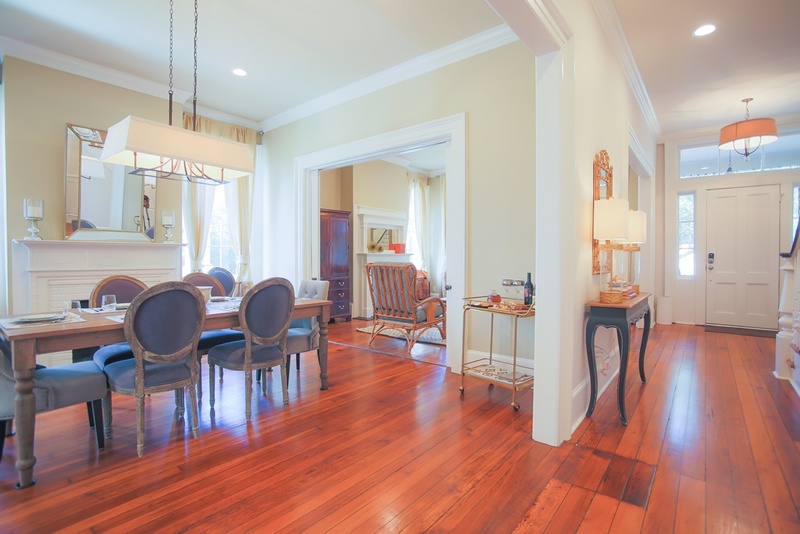 This home was exceptionally well appointed and provided all of the amenities you could ask for. Beautifully decorated. An easy walk to restaurants, museums, and parks. I would recommend this property to anyone traveling with family, as there is plenty of space to spread out. Thank you for choosing to stay with Lucky Savannah! We are happy to hear you found the home to be well appointed. The Gaston Estate is definitely spectacular! We appreciate you recommending this home to others. Our team hopes to have you all as our guests again! Please don't forget about our 10% "Returning Guest" discount. We stayed here for a mini family reunion and it could not have been more perfect. 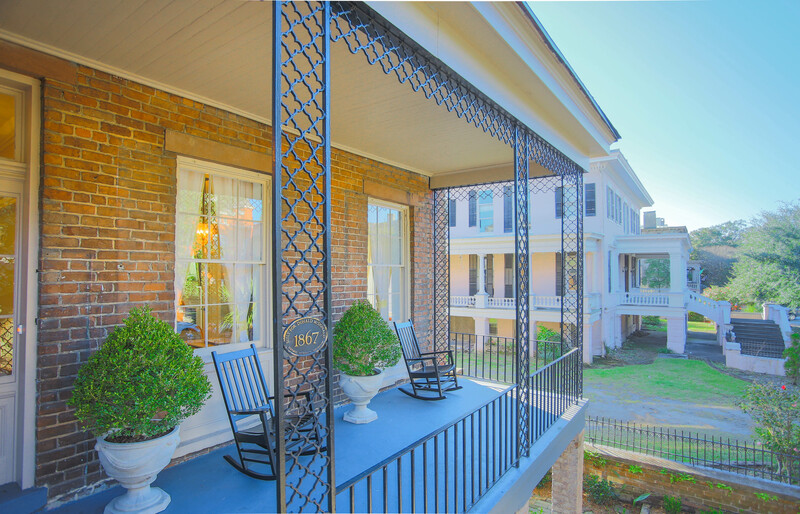 The house is beautiful and great for family meals and enjoying all that Savannah has to offer. We especially loved being able to walk to Forsyth Park. There is also a large grocery store within walking distance. My family of 5 and I stayed at the Gaston Estate in April of 2016. 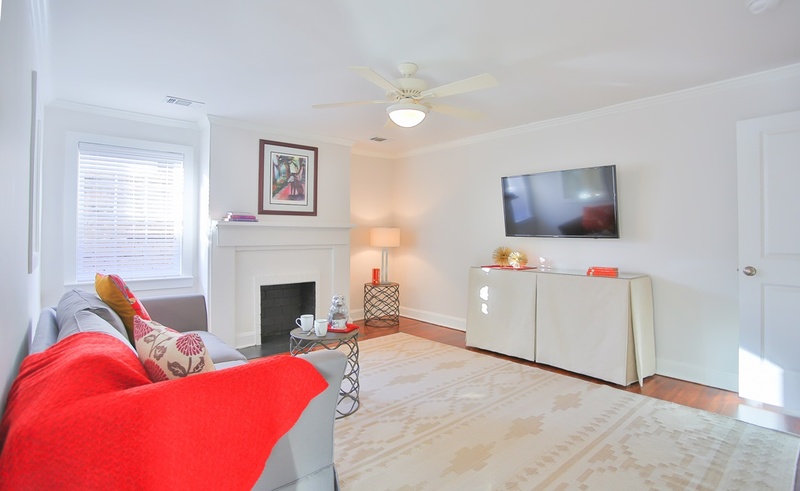 The home has been totally renovated and updated equipped with lots of character and charm and the decor was very homey and inviting. The parking area in the back made for coming and going very convenient. 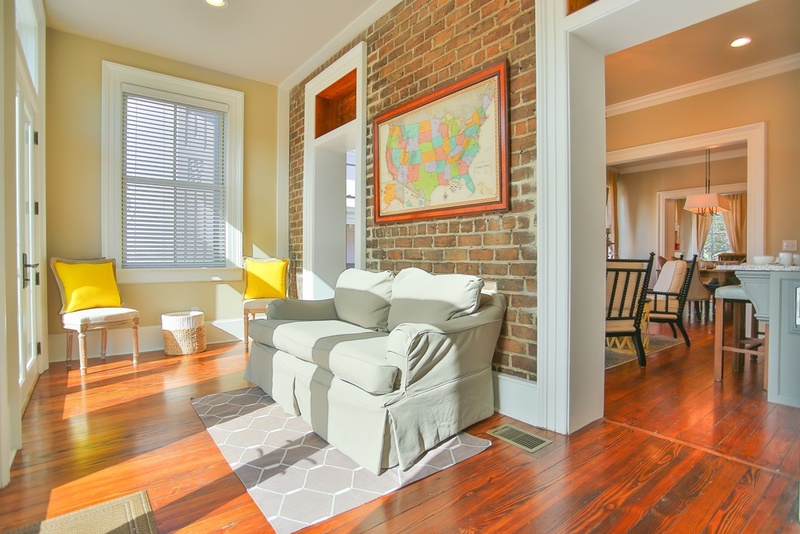 It is close to Forysth Park and the historic district of Savannah. If you'd ask any of us what was the best part of our trip, we would all have to say, "the house"!! Thank you to all the Lucky Savannah team, and an extra shout out to Josh Dean for his excellent customer service skills - you rock!! Thank you for choosing to stay with Lucky Savannah! The Gaston Estate is a great choice for larger families, reunions, and groups. 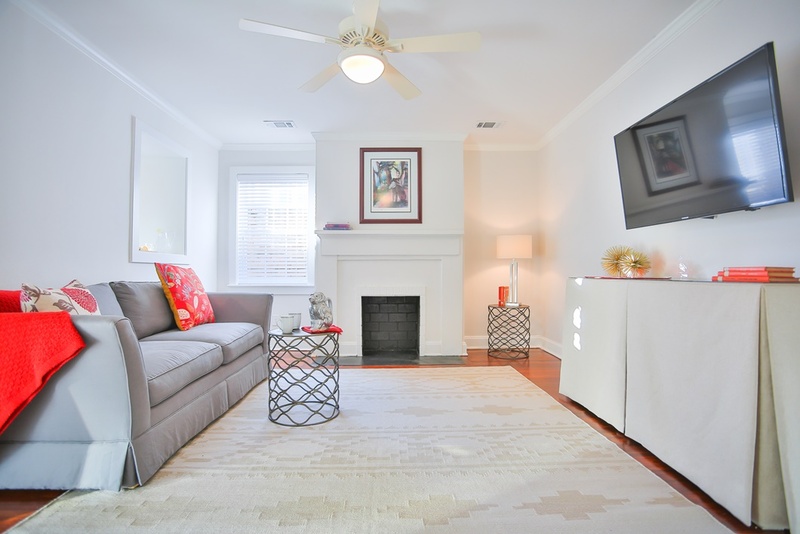 This home has been renovated, top to bottom, and has been tastefully finished. Thank you for your kind words, and we appreciate the honest review. We cannot wait to have you all here again in the near future! Please don't forget about our 10% "Returning Guest" discount.